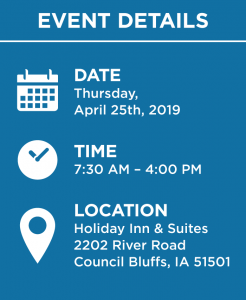 Future OPS is an Omaha-area bank technology conference that attracts banking professionals from all over Nebraska, Iowa, Kansas, Missouri, and South Dakota. The next conference is April 25, 2019, in Council Bluffs. Scantron is proud to be one of the premier sponsors alongside Harland Clarke, Tierpoint, and Shazam software solutions. During the course of the conference, there will be multiple tracks with several 30 to 35-minute sessions. Attendees love this format because it gives them the important bullets for many different topics and solutions in a condensed day. This will mark the 9th edition of the conference. It takes place at the Holiday Inn and Suites next to the Ameristar casino in Council Bluffs, which works out to be the ideal venue for the expected 80 or 90 attendees. It includes continental breakfast, snacks, a sack lunch, many great door prizes, and a round table session. This year, Scantron will deliver sessions on Managed IT Services and Managed Print Services. Register on the Future OPS web site or call 800-888-2135 and ask to sign up for the Future OPS event. Registration will begin at 7:30 a.m.